Are you suffering from mid back pain? Don’t worry! About 75%-80% of people suffer from back problems at some point in time. Many individuals attribute the pain in the back to the lumbar spine (lower back) or the cervical spine (necks). However, the issue often lies in the thoracic spine, which is the upper spine. Now the thoracic spine doesn’t get much attention, still, it is the backbone of your heart and lungs which is surrounded by the rib cage and protects the vital organs. Among the 70 joints of the spine, 50% lies in the thoracic spine. So, if you factor in the extra 20 specialty joints (known as costotransverse joints) which assists in articulating and movement of the ribs, you will find out that thoracic spine is one of the workhorses that is responsible for the ⅔ rd of the movement of the torso. Some of the major causes of the thoracic or middle back pain are sporting injuries, medical conditions, injuries to the thoracic region due to automobile accidents, muscle strains, etc. Sometimes the sudden movement of the back will also cause pain in the thoracic region. ◼ Paget Disease – A medical condition where there is a loss of abnormal bone tissue. ◼ Osteoporosis – This is a medical condition where the bone becomes weak and thin. ◼ Osteomyelitis – This is caused due to the inflammation or infection of the bones and will cause thoracic back pain. ◼ Pain in the thoracic back due to Osteoarthritis – Here there will be an abnormal breakdown of the cartilage. This causes the bones to rub against each other and causes extreme pain. ◼ Pain in the thoracic back due to spinal degeneration – This is a medical condition which happens due to inflammation or infection of the spinal joints. ◼ Physical Therapy – Here, the rehab trainer will create a detailed treatment plan which depends on the severity of the pain. It contains various exercises focused on increasing the flexibility and strength of the spine and assist in controlling the pain. Now if you are suffering from a severe pain, then a full course of physical therapy might not be needed. You need to do mild tennis ball exercises for releasing the pain. ◼ Massage – Regular massages to the affected area will help in controlling the symptoms related to thoracic back pain. ◼ Medications – Various medications like ibuprofen or Tylenol are helpful in relieving the discomfort and pain in the thoracic back. In addition, these medications are quite helpful for treating the osteoarthritis symptoms. ◼ Antidepressants – These aren’t only apt for controlling depression but even help in treating the symptoms involved in the thoracic spine problem. Frankly, there are various individuals who are suffering from thoracic spine problems and still assume that they have is a normal back pain. However, it is not severe if the pain is small but if you are really irritated and feel the pain is unbearable, then it is better to consult a doctor. Prolonging your thoracic spine issue can be dangerous and risky for your health. 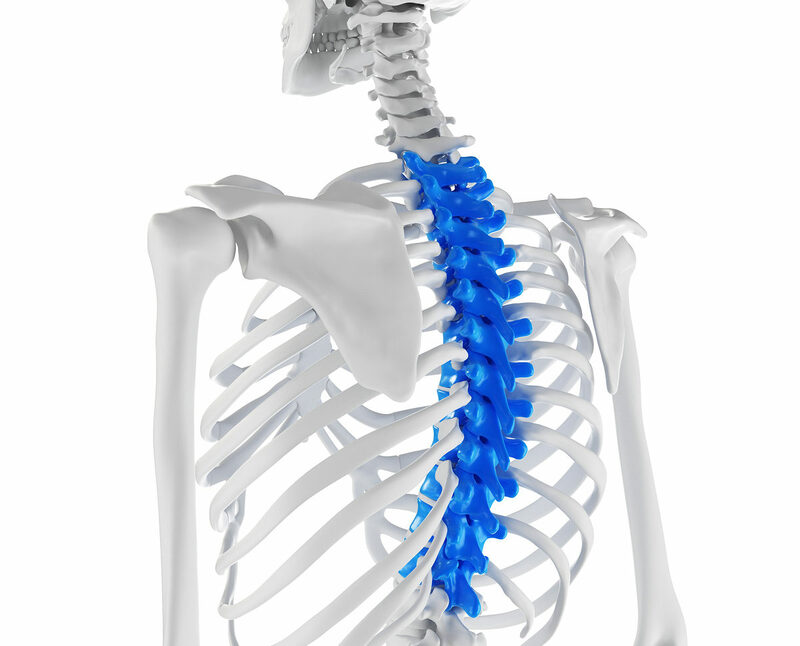 A stiff thoracic spine affects your lumbar and cervical spine. Stretch them out with a certified professional from EzFit. It will do you wonders to your quality of life.